There are film scenes that we love, and there are scenes that we loathe (or hate). As such, we like to celebrate the good ones and shame the bad ones. Today, it’s time to talk about a bad one. This is the scene from Jurassic Park that causes us to involuntarily exclaim “I LOATHE That Scene!” whenever it is brought up in conversation, and that’s only if we’re being nice. Think of it as our Razzies companion to our Oscars’ I LOVE That Scene. THE PLOT: Based on a novel by Michael Crichton, Jurassic Park tells the story of an eccentric billionaire (Sir Richard Attenborough) who uses DNA technology to resurrect multiple dinosaur breeds for a high-concept zoo. He invites his grandchildren (Joseph Mazzelo, Ariana Richards), two archaeologists (Sam Neil, Laura Dern), his lawyer (Martin Ferrero), and a mathematician (Jeff Goldblum). Everything goes completely according to plan and the park only opens to great financial success. Nah, only kidding. The dinosaurs break out and everyone who’s not a main character dies. I love the movie Jurassic Park. It’s scary, funny, and plays like a well-constructed roller coaster. Spielberg is now making “important” films based around significant, historical events. However, I think Spielberg is at his best when he is making quality, audience-engaging blockbusters, such as Jaws, E.T. : The Extra-Terrestrial, and Raiders of the Lost Ark. 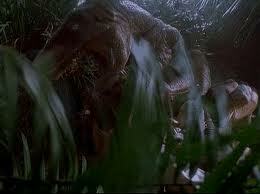 However, Jurassic Park does have one scene that never fails to make me roll my eyes in frustration. 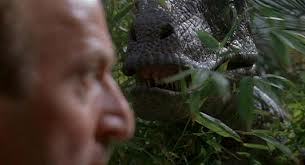 Jurassic Park gameskeeper Robert Muldoon (Bob Peck) is stalking and preparing to kill one of the three escaped velociraptor. 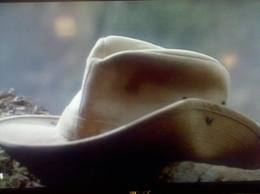 He places his hat on a log in order to trick an animal who he has already described as “extremely intelligent, even problem-solving intelligent.” As he is preparing for the kill, another raptor surprises him in a side attack and shuffles him off this mortal care (or, you know, tears him to bloody, tattered ribbons). He might be alright… Well, maybe not. WHY I LOATHE IT: It never bothered me as a kid, but watching it in my teens made me realize eccentric billionaire John Hammond apparently hired the worst gameskeeper ever. He claims to know more about velociraptors than anyone else, but he doesn’t know this basic tenet of how they hunt. Even more, he seems to think simply placing a hat on a log is really going to fool freakishly intelligent creatures. I know what you’re thinking: “Come on, they’ve been held in a pen and fed by lowering cows (who probably thought they’d hit the lottery when they were saved from the slaughterhouse and then realized their fates were far, far worse) into their pen. He hasn’t had a chance to see them hunt.” Fine. I accept that, except for the fact that archaeologist Alan Grant knows how they stalk and attack (and he put a kid into therapy to prove it). All he’s seen are bones, and he’s got their hunting patterns down cold. Muldoon is an expert in velociraptors, but he gets killed in a manner that every audience member could have avoided, because WE’VE HEARD A CHARACTER TELL US TO LOOK OUT FOR THIS!!! It makes Muldoon seem like the ultimate gullible sap, rather than an expert hunter. As it is, he is killed thus freeing up the the raptors to nearly take out the rest of the cast before they themselves are killed by the ultimate deus ex machina: the quietest, most soft-footed T-Rex ever. I could probably do another I LOATHE That Scene on this scene as well, but I think I’ll leave it here. Am I being too hard on the scene? Or do you think I was too easy on it? Are there any specific scenes that cause you to roll your eyes even if the movie is actually pretty good? Let us know in the comments. I share your appreciation for the fun factor of the film (can you believe it’s been twenty years?) and I too never cared much for that scene either for the very reason you explained. However I also didn’t much like any of the scenes with Wayne Knight ‘s character, especially his death scene. His earlier bumblings (don’t get me started on the depiction of computer systems in the film either) just make him out to be a buffoon (the less said about the corporate spy the better) but in his death scene he showed an amazing stupidity regarding the dilophosaurus. His reaction should have been something akin to Harrison Ford’s when Indy found himself face-to-face with the cobra in Raiders. Humans tend to have a inbred uneasiness when confronted by reptiles, especially large ones. Does the scene also suggest that the dilophosauraus hunted by pretending to just be a curious pet? It knew he was going back into the jeep so instead of just eating him while he sat in the mud blinded, it headed to the passenger side of the jeep instead? What we get is a bumbling idiot killed by a dinosaur seemingly more intelligent than he is. The scene was far too obvious and far too farcical for my taste. As for the ending, I didn’t mind the finale given how the scene was originally going to unfold. One of the raptors was going to be impaled by the falling dinosaur skeleton while Grant fought off and eventually killed the other. I can’t conceive any scenario where an unarmed human (make that humans) would be able to defeat a predator like that without the aid of a ranged weapon. When watching the end of the film, I had a genuine feeling, one of the few times in watching films, that I wasn’t sure how the hell the characters would survive. The T-Rex neatly solved that. Could it have approached unheard? Maybe not but what’s to say it wasn’t already there BEFORE they showed up or were in that part of the building, laying in wait like predators do or feasting on some other loose dinosaur it downed nearby? Either way, the T-Rex’s appearance made for a more believable ending than we’d probably have gotten if Spielberg hadn’t decided to bring back the “real star”, as he put it, of the film. Noticed some typos. Damnit, I need to proofread before hitting “Post Comment”.